While all the other stories that have been reviewed for this column have been fairly dark, since the yuletide is upon us it was decided to look at something less dark and more festive in tone. As Christmas is a time for watching cheesy movies it seems appropriate to look at a suitably cheesy Batman story from the golden age of comics (1948 to be specific) filled with Christmas cheer. The story begins with Batman and Robin coming across an ex-convict who is on parole, Ed Rogers. Rogers has just been attacked by a gang who are subsequently locked up by The Caped Crusaders (we never get to find out if they are ever let out of their makeshift prison) while they save Rogers. Instead of taking Rogers to the authorities, The Dumb Duo take him back to the BatCave where they discover that he looks exactly like Bruce Wayne. What a coincidence! Deciding that he must go and pretend to be Rogers to make sure his girlfriend knows that he is out (even though she doesn’t know he is coming or that he has been in prison) and have a happy Christmas with her. From this point the plot goes further into a sea of ridiculousness with no one making the connection between Bruce Wayne, the famous billionaire and his doppelgänger as Batman bumps into someone on purpose to get sent back to jail as Rogers. The simplistic plot appears to have at least a dozen holes in it such as why Batman doesn’t just go in to Rogers cell himself to stop the crime boss who tried to kill Rogers from escaping; why the Gotham police automatically believe that Robin is Robin and not someone pretending to be him; why Batman and Robin don’t just take Rogers to a hospital rather than apparently kidnapping him and locking him in the BatCave and why Batman has a Batsuit made out of raincoat material. Though it has many holes in it and is fairly dated – not surprising given it is sixty six years old, “A Parole for Christmas” is still a strangely charming story of Batman attempting to help someone, even if it is in a hand fisted way, get their perfect Christmas. Readable simply for its old worldy charm “A Parole for Christmas” is certainly a recommendable Christmas comic classic. 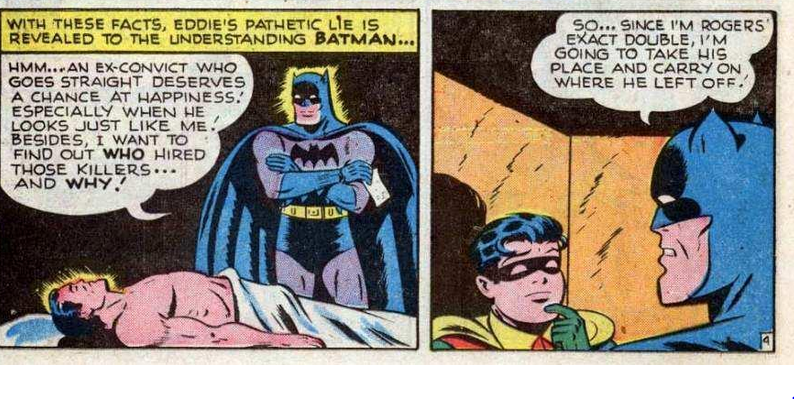 In the next edition of The Dark Tales of The Dark Knight we look at a much more recent story taken from the pages of Detective Comics: “Terminal”.